Designed to provide extra storage with added convenience, the cool-zone™ is great for chilling platters, sheet cakes and snacks. The low level drawer is great place to store food and drinks for kids to access and the slide out drawer makes it very easy to access everything inside. If the refrigerator door isn't opened for 24 hours, the refrigerator will go into energy conservation mode which will save you money and reduce environmental impact. Store more items in the door. Big enough to fit gallon sized containers and two liter bottles, you can have more shelf space for other food. Finding room for large items can be difficult, especially when the shelving is already configured to the way that normally works best for you. This refrigerator features one shelf that easily flips up and one that easily slides under another shelf to create space for large items. With the push of a button, quick freeze drops the temperature in the freezer to help seal in freshness of food. Spill proof shelves are designed with a plastic border that will prevent spills from running over the shelf and onto other parts of the refrigerator. It may not stop you from spilling but it will help contain those spills. With the touch of a button, easily choose between water and ice options. Meets the requirements of Star-K Kosher Certification. This ENERGY STAR® french door refrigerator has 27.8 cubic feet of capacity to store your family's fresh and frozen foods. Adjustable interior storage gives more than 100 different ways to configure your refrigerator, so you can make room for all your food products. SpaceWise® Flip Up & Slide Under Shelves, Effortless™ Glide Crisper Drawers, and Store-More™ gallon storage bins make organizing and customizing your refrigerator a piece of cake. In addition to these conveniences, this refrigerator has a second icemaker option, PureAir Ultra® Filters to keep the interior fresh, a Quick Freeze option that speeds up the cooling process. The quiet design reduces the operational noise so you can go about your day in peace. This is a great refrigerator that you're sure to enjoy every day. 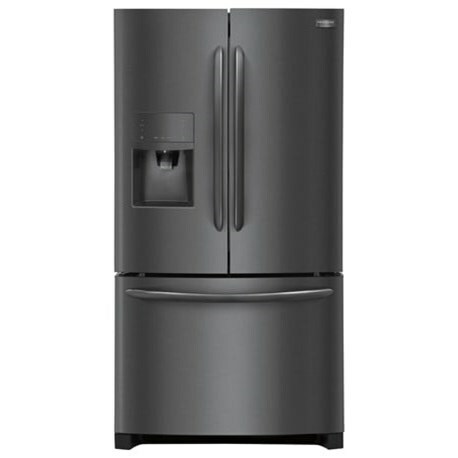 The Frigidaire Gallery Refrigerators Gallery ENERGY STAR® 27.8 Cu. Ft. French Door Refrigerator with SpaceWise® Flip Up & Slide Under Shelves by Frigidaire at Furniture Fair - North Carolina in the Jacksonville, Greenville, Goldsboro, New Bern, Rocky Mount, Wilmington NC area. Product availability may vary. Contact us for the most current availability on this product. Quick Freeze: Quickly freeze whatever you store to keep foods at their freshest. Express-Select® Controls on Ice and Water Dispenser: Easily select options with the touch of a button. Effortless™ Glide Crisper Drawers: Keep your fruits and vegetables fresh in our humidity-controlled crisper drawers which easily glide out, and are designed to effortlessly close. SpaceWise® Flip Up & Slide Under Shelves: Easily make room for tall or large items with the new Flip-Up and Slide-Under shelves. Best-in-Class Ice & Water Filtration: PureSource Ultra® Water Filtration offers best-in-class water filtration so you get cleaner, fresher ice and water for your family. Effortless™ Glide Freezer Drawers: Drawers glide out smoothly and fully extend, giving you easy access to what's inside. Full-Width Cool-Zone™ Drawer: A large capacity Cool Zone™ drawer extends completely and provides space to easily store anything from sheet cakes and large platters to snacks and juice boxes. Store-More™ Bins: Our gallon-size bins are designed to store more, so you can fit a gallon of milk. PureAir Ultra® Filters: Our PureAir Ultra® air filters effortlessly keep the air in your refrigerator fresh. Capacity: Refrigerator 19 Cu. Ft.
Capacity: Freezer 8.7 Cu. Ft.
Capacity: Total 27.7 Cu. Ft. Shelf Area 30.3 Cu. Ft. Depth with Door at 90° 47.375"
The Frigidaire Gallery Refrigerators collection is a great option if you are looking for Appliances in the Jacksonville, Greenville, Goldsboro, New Bern, Rocky Mount, Wilmington NC area.